Augmented Reality (AR) is a medium with the direct or indirect addition of the physical world to real-time digital data using computing devices such as tablets and smartphones, as well as innovative gadgets like Google Glass, and software for them. An Augmented Reality System: How To Use It Effectively For Industry? The control system in Augmented Reality can be mobile, as well as able to move and integrate with equipment that is already available in the workplace. Production tools such as programmable machine vision cameras, laser trackers, robots, and spinning guns can be seamlessly implemented to ensure the accuracy of the task. For example, when aligning pipes, tightening bolts or sequentially assembling the device. A projection-based control system can have projects and drawings, training videos, and virtual gauges for key steps directly on the desktop. At the same time, all this is located right in front of the operator’s eyes. Inspectors can connect an Augmented Reality system to their mobile phones and receive updates when errors occur. Thus, the system, in turn, will be able to effectively identify problem areas. In addition, the system automatically collects data on key processes, including serial numbers, the number, and dates of cycles, the date and time of events, as well as the number of errors and photos of each step in real time. The ability to measure the cycle time at each stage ensures that potential problems are identified quickly and without overloading the process, which only improves the procedure. One of the most valuable qualities of an Augmented Reality system is that it can solve fundamental problems for any number of different industries. For example, a common problem for car manufacturers is the high degree of change of similar components required for car assembly. Differences in detail are often subtle, but they have a large impact on functionality, which can lead to costly errors when installing parts from other people's devices. This problem is also crucial for the assembly of medical devices, many of which are complex mechanisms and have problems with adjustments due to the high degree of variability. It is very important to fasten the correct doors to the required vehicle. In medicine, to mix implants and put the wrong hip or knee joint will cost the patient too much. Such precision operations must be supported by technology. Perhaps the most interesting aspect of using Augmented Reality technology in production is not only that it reduces the number of errors and increases efficiency, but also that it makes workers more productive, gives work to people and preserves their jobs, thus fighting unemployment. This is all because, unlike many automated systems, Augmented Reality integrates human intelligence with software, acting in collaboration with a real living person. The Augmented Reality system can eliminate the need for written work instructions, allowing staff to keep all tasks in a convenient compact format before their eyes without searching for cumbersome instructions. A smart and intuitive control system with Augmented Reality offers an increased level of participation in the manual assembly process and works well with human ingenuity and precision of technology, and this is exactly what we need in order to make the manufacturing sector work, as it should for the good of the country. Now all industries in the manufacturing sector are looking for ways to cut costs while improving product quality. This is a rather ambitious goal; however, advances in technology provide a much-needed step to make huge improvements in general practice and standardize complex processes. By simplifying steps and using various visual cues, as well as a quality assurance system, the Augmented Reality system can provide greater production flexibility without the added risk of making mistakes. Its strength lies in the unique ability to simplify a variety of complex tasks associated with modern manufacturing and assembly processes, reduce risks, and bring to life the products that are part of the new 21st century. Augmented Reality allows you to fundamentally change the way people work. It provides a convergence of the digital and physical worlds, benefiting all divisions of the enterprise. 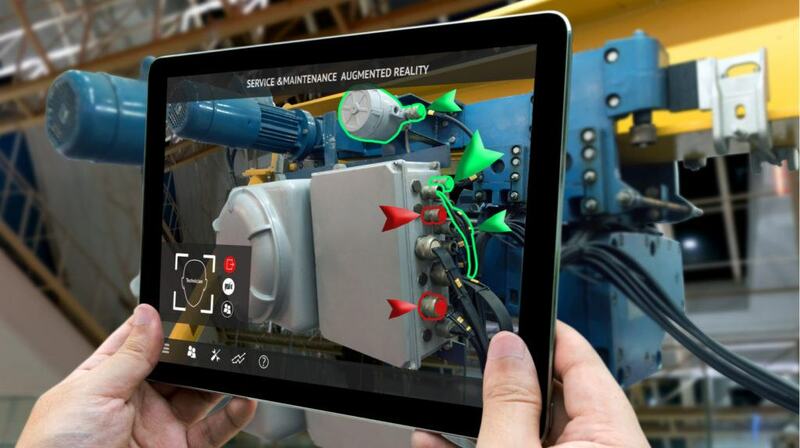 In combination with IoT data, Augmented Reality applications become truly transforming the situation, allowing many enterprises to take a completely new look at the processes of designing, manufacturing, marketing, operating and maintaining products.